Your BSC business is growing. You’ve landed some new contracts, expanded your territory, and are ready to reach for the next level. As you enjoy the warm glow of success, it hits you — how will you actually handle all of this new work? Congratulations! You’ve reached a milestone that most flourishing BSCs reach sooner or later. It’s time to consider hiring subcontractors. Exactly what triggers the need for subcontractors varies from business to business, but growth is almost always at the heart of the matter. Regional and national chains continue to knock out small independent businesses, making multiple-location contracts a reality for many growing BSCs. Tackling this work requires BSCs to be in several places at once, including locations outside their typical geographical reach. Instead of doubling up on employees and sending new teams in new vans to far-flung locations, it often makes more sense to subcontract. The cleaning contract is in your name and you maintain all client relations and administration, but your subcontracted BSC or cleaning crew does the work under a separate contract with your business. The arrangement allows you to take on additional work without fear of over-promising and under-delivering. Diversification is another common reason for subcontracting. Offering window cleaning as an add-on service, for example, will make you more attractive to potential clients as a one-stop cleaning solution, but the extra equipment, staff, training, and specialized insurance required are a formidable investment. Sinking that kind of money into your business at a crucial growth point is risky, especially before you’re certain about demand. This is an ideal situation for subcontracting. Pay a small specialist firm to do the work on your behalf. They have their own tools and trained window cleaners, and are covered (mostly) by their own insurance. Perfect. The IRS draws a very strict line between employees and subcontractors, and you should, too. Hiring employees means payroll taxes and legal responsibilities. Working with a subcontractor eliminates the responsibility for withholding tax, but does require tax forms (specifically, a W-9 and 1099). How does the IRS delineate an employee from a subcontractor? It’s often on a case-by-case basis, but there are three basic factors to keep in mind. Behavioral Control: Who has the right to decide how a job is done? 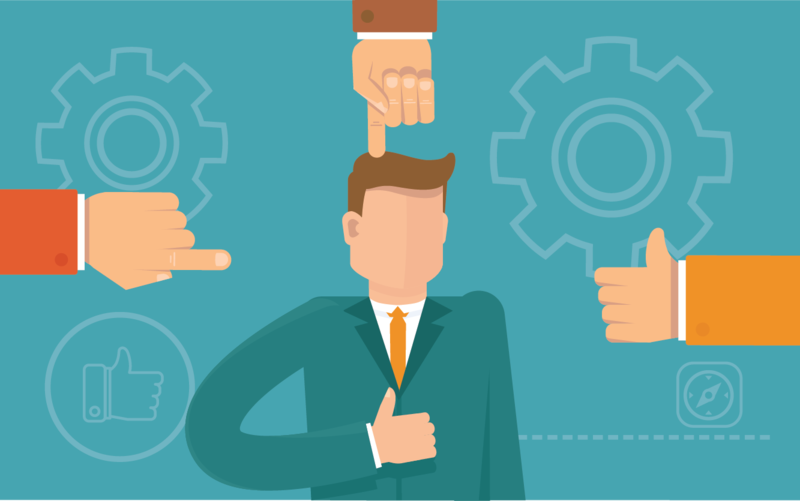 For a worker to qualify as a subcontractor, they must maintain control over their work. You can set standards and deadlines, but how the work is completed is up to them. Financial Control: Who has the right to make economic decisions on a job? In general, a subcontractor should provide their own equipment and supplies, and carry their own insurance. They are paid a flat fee and can decide how to use that fee. Relationship of Parties: How do you and the worker view the relationship? Do you provide benefits (paid vacation, sick days, pension, etc.) and what’s nature of the written contract between parties? More on this in a minute. Your name and reputation are on the line when you work with subcontractors, so you want to know they’re capable of completing the work to your standards. The best bet is finding a small but established firm that has their own business licence and liability worker’s compensation insurance. This will make it much easier to prove the firm qualifies as a subcontractor (not an employee) if you ever go through an employment tax audit. Ask for references and read online reviews (on Google, Yelp, and social media sites). Once you’ve narrowed down potential subcontractors to a short list, share the job specs (square footage, frequencies, schedule, etc.) to determine who is best equipped for this particular client and job. Before signing the dotted line, attend a site walk-through with the subcontractor to see how they operate in a professional setting. Need help finding the perfect subcontractor for your needs? 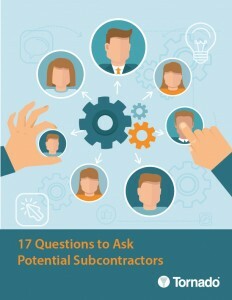 Download our free checklist, 17 Questions to Ask a Potential Subcontractor. 1. The subcontractor is underperforming, causing problems with the client, and putting the account in jeopardy. 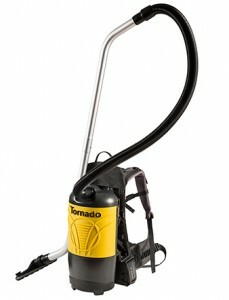 If cleaning isn’t being completed to standard, the buck stops with your company. Carefully vetting the subcontractor is the first step in avoiding this problem, but very clear and legally-binding communication is just as important. Your contract should spell out the scope of the job, listing all responsibilities, standards, deadlines, and fees. Indicate that you will perform random quality checks, and lay out a procedure for correcting incomplete or substandard work. Also include a provision that you or the subcontractor can terminate the contract at will, with a specified notice period. 2. The subcontractor does not have adequate insurance, leaving you exposed to substantial liability. Clearly specify in the contract that the subcontractor is not an employee, and they are responsible for reporting and paying their own taxes and benefits. This is important for tax reasons, but for limiting your liability if anything goes wrong. You can also include a provision requiring subcontractors to obtain and maintain insurance, including general liability, automobile liability, janitorial errors and omissions (E&O), and worker’s compensation. Keep copies of Certificates of Insurance for these policies in your files. Keep tabs on expiration dates and make certain the coverage limits are acceptable. You may also want subcontractors to sign an indemnity (or “hold harmless”) agreement. Although not insurance, it’s an extra precaution that allows you to transfer risk contractually from you to the subcontractor. If you or your business are sued as a result of any incident related to your subcontractor, they agree to take responsibility for that lawsuit. 3. The subcontractor is not complying with employment or immigration laws, which could implicate you in an illegal situation. Recent lawsuits have held companies responsible when their subcontractors broke minimum wage or other employment laws. To protect yourself, pay your subcontractors enough to allow them to reasonably comply with applicable local, state and federal employment laws. It may be tempting to take the lowest quote, but bargain-basement rates may indicate irregularities in the way a subcontractor hires and pays workers, pays employment taxes, or handles employees’ working conditions. Finally, have the subcontractor sign a certificate of compliance with immigration laws and regulations. This affirmation that employees are legally allowed to work in the United States may help protect your company in case of problems. As your company grows, the smart use of subcontractors can open new doors for you and your business. Understanding everything that goes into a healthy subcontracting relationship will help you take advantage of any amazing opportunity that comes your way.